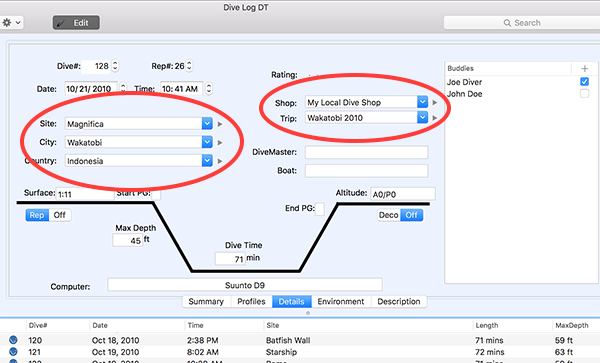 If you have used our software, you know that it logs individual Dives, and that a Dive can have many other items associated with it, such as a Dive Site or Equipment or a "tag" called a Dive Type. 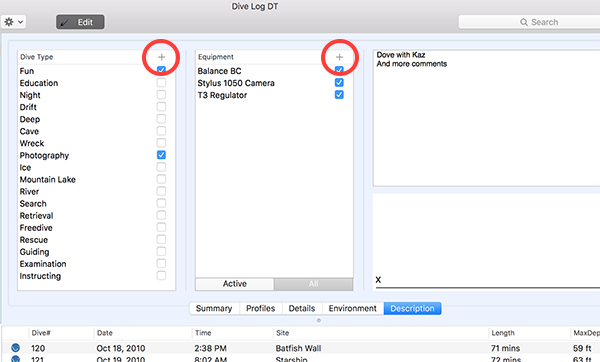 When logging a dive, sometimes you have lot's of time afterwards to sit and record everything in great detail and luxuriate over the details while you remember what a great time you had. But let's face it, sometimes you need to just quickly "get it done" so you can do something else. That's when you may want to do a "Quick Add" of an item while you're logging your dive. You can "Quick Add" any of the dropdowns on the Detail tab of a dive. Just type in the name and tab to the next thing. If that name doesn't already exist in the list of those items, you'll get a small bubble window telling you that the new item has just been added. This works for Site, City, Country, Shop, and Trip. When there is a list of items that can be added, you can also add a new one by clicking on the "plus" sign in the upper corner. Once clicked, you'll get a popup window you can just start typing in. Hit return and the new list item has been added and you can continue logging. This works for Buddies, Dive Types, and Equipment.